This is a fantastic picture of Cairo, taken at the Rex Hotel during his stay last weekend. Eileen and I spent a long weekend in Seattle, trading the rainy damp weather of Vancouver for a different brand of wet, windy, cold weather. We visited the Seattle Art Museum to see their show European Masters: Rembrandt, Van Dyck, Gainsborough. Amazing works to see, its a great collection of classics from that period. This collection is from Kenwood House in London, originally the collection of Edward Cecil Guinness, 1st Earl of Iveagh. After making a huge fortune from the Guinness brewery he spent a significant portion on paintings. These painters were very prolific, some painting hundreds of works in their lifetime. 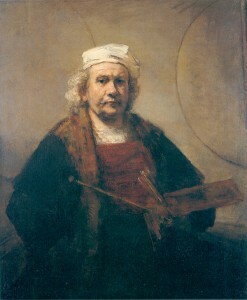 Rembrandt is considered the master of the masters, and the collection has some very good examples of his work, including his iconic self-portrait included here. We also stopped into the Library Bistro & Bookstore Bar, our favorite place for cocktails. There we met Geerbox and Mongo, two Navy guys who flew P-3 reconnaissance flights together but now have separate duties on the USS Ronald Reagan. Great guys to talk to, and it turns out Geerbox knows everyone. We wanted to go to the Pink Door for dinner but couldn’t get reservations. One phone call later by Geerbox to his friend Joan and we were in. The Pink Door is incredibly busy and very energetic, a great atmosphere and dinner was extremely good. We didn’t have the “Geerbox Manhattan” (supposedly named for our new friend) but we’ll drop in again to try it out sometime. We always have a great time in Seattle and makes us want to visit again soon. Today marks one more orbit around the sun for me. Looking forward to many more!